Your photo's are still beautiful despite your lack of assistants;) I've been a little obsessed with cornmeal lately since I ordered some from Anson Mill's. I can't wait to try this. 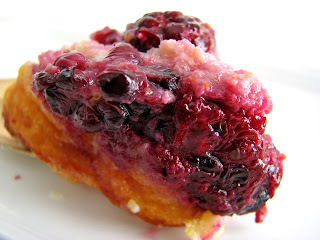 Cornmeal and blackberries are meant for each other. That looks delicious! I might have to try this once I can get fresh local berries up here! what a great job that must have been! i dream about that. 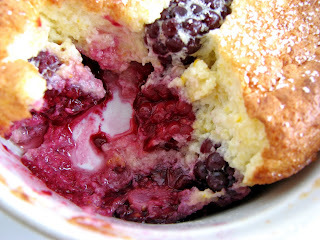 the texture of the pudding like souffle and the cornmeal has to be terrific! You just brought back tons of memories. I spent 3 1/2 weeks filming a crafting tv show and the experience sounds very very similar. Bookworthy for sure! This souffle looks amazing! I love the idea of cornmeal in it. What a wonderful opportunity, indeed!! Thank you for sharing!! Oh my, that soufflé - perfection!! I can't even imagine what it takes to photograph food for a tv show, I have a heck of a time just taking pictures of what I bake! 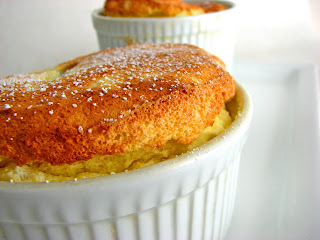 This souffle looks wonderful, I've never baked with cornmeal either but have some and will try this, thanks! 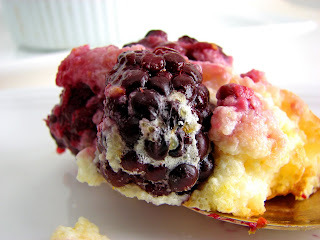 Cornmeal and berries! Sounds fantastic and what great looking souffles, despite your trouble photographing them. Ooh this is a great idea for using some of the cornmeal I bought for another recipe. I have a huge bag that needs to go to use. And to second and third what others have been saying, the photos still look lovely. What beautiful souffles, I love the colors! That sounded like a great opportunity! This is the kind of cake we love to eat on Sunday evenings...cozy and delicious!